« Netanyahu in UN: Blasts Islamic State, Hamas, and Iran, but what will happen in Israel? 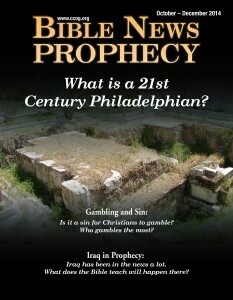 The latest edition of the Bible News Prophecy magazine is available. Here is a pdf link to the October-December 2014 edition of Bible News Prophecy magazine. 3 What is a 21st Century Philadelphian? Did Jesus teach that there would be significant differences between Christians in the end times? What are some characteristics of a Philadelphian? 8 Gambling and Sin Is it a sin for Christians to gamble? Who gambles the most? 13 Study the Bible Course Lesson 4: This is the fourth lesson of this course to help people study and better understand the Bible. 23 New Booklet: Where is the True Christian Church Today? 24 My Favourite Day Why is the Sabbath John Hickey’s favourite day? 25 Fasting and Atonement Why do we fast on the Day of Atonement? Are there any health benefits associated with fasting? 28 Iraq in Prophecy Iraq has been in the news a lot. What does the Bible teach will happen there? 33 The Catholic Encyclopedia on Christmas Roman Catholics celebrate Christmas, but their scholars realize some of the truth about it. Here is a pdf link to the October-December 2014 edition of Bible News Prophecy magazine. This entry was posted on Tuesday, September 30th, 2014 at 12:01 am	and is filed under COG News, Prophecy.